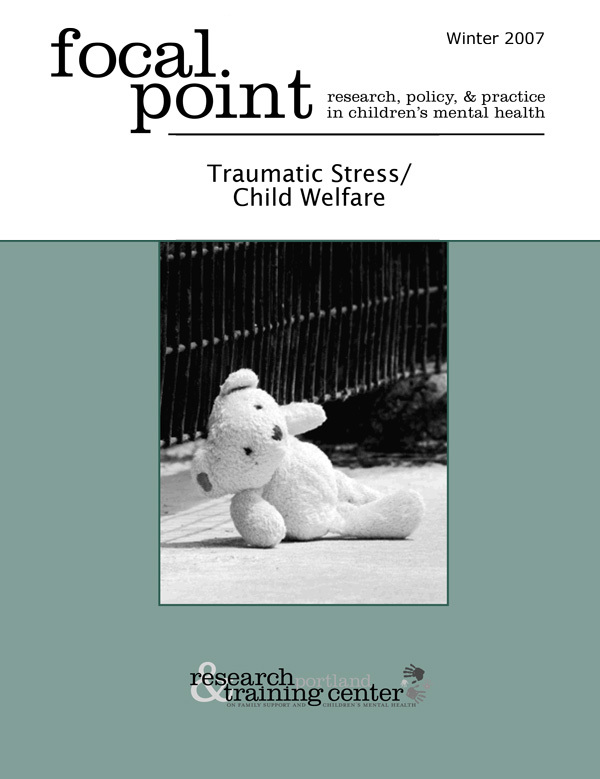 This Focal Point issue focuses on child traumatic stress, particularly as experienced by children involved in the child welfare system. The causes and effects of traumatic stress are discussed, as are evidence-based treatments, and prevention strategies. Walker, J. S. & Weaver, A. This article defines child traumatic stress, describes some events that can cause traumatic stress, and summarizes the effects it has on children, youth, and society. The guest editor of this issue of Focal Point gives a poignant first–person account of his childhood abuse and subsequent recovery. A strong theme of Aaron's story is the enduring support and love offered by his foster family. Stambaugh, L., Burns, B. J., Landsverk, J., & Rolls-Reutz, J. This article reviews several treatment programs for children in the child welfare system who have experienced traumatic stress. The article focuses on treatments for which there is the best evidence of effectiveness. This article focuses on the need for early intervention to address child traumatic stress in young children. The article also describes the characteristics of effective intervention. Bigfoot, D. S., & Braden, J. This article describes the adaptation of several evidence-based treatments (EBTs) for child traumatic stress for use in Native American communities. The EBTs that are discussed attend to the broad cultural, historical, and intergenerational traumas that are part of the life experience of many Native American youth. Igelman, R., Conradi, L., & Ryan, B. One role of the child welfare system is to remove children from abusive or neglectful home environments. Ironically, sometimes the system itself can be a source of trauma. This article provides steps for reducing trauma within the child welfare system. This article discusses the impact that federal, state, and local government policies have in promoting increased understanding of and effective response to child traumatic stress. Analysis of current policy issues and areas for improvement is included.